In the studio, practice room or at more intimate gigs, the Line 6 Spider V 60 Watt 1 x 10 Guitar Combo Amplifier is a superb amp full of innovative features. With loads of built in models and effects, plenty of connectivity and a custom designed speaker, the Spider V 60 is a portable amp with heavyweight capability. The Spider V 60 gets its sound using a combination of the built in 60-Watt efficient amplifier, the sound of which is then projected through a custom designed 10" driver and HF tweeter. This two-way speaker system not only helps your tone sound fuller but also increases the quality of any backing tracks you play through the Spider V 60. The Spider V 60 comes loaded with 128 up to date amp models and effects. Everything from comp, distortion and reverb to delay, pitch, modulation and synth sounds. Whatever genres and styles you like to play, the Spider V 60 will deliver without disappointment. Should you wish to jam along with your favourite tracks, the Spider V 60 not only has a standard line input, but also includes connectivity for your favourite iOS or Android device, along with USB connectivity to your Mac or PC. You can even connect your guitar wirelessly with an optional Line 6 Relay G10T transmitter which will leave you without the constraints of traditional wiring. 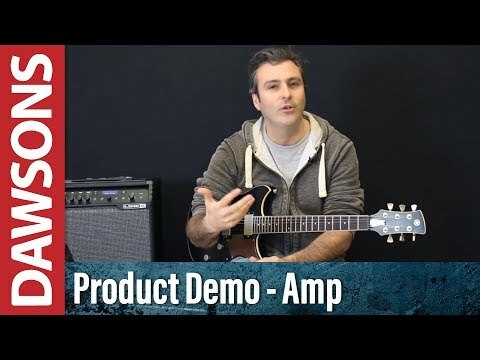 If you want an amp that can hold its own at smaller gigs, deliver sheer clarity in the studio and help you to master your technique, the Line 6 Spider V 60 Watt 1 x 10 Guitar Combo Amplifier is an excellent choice.